Harry Potter mania has largely subsided, but many young people still read and enjoy these books and they are destined to become classics. In addition, with the release of an eighth book this summer, no doubt many people will be rereading or reading the first seven books for the first time. Whenever one starts talking about Harry Potter in Christian circles, one can be opening a can of worms. People tend to have strong feelings about these books, either for or against. Those against argue that the books promote witchcraft and new age spirituality. These people have likely never read the books. Those who have read them argue for their inherent Christian symbolism, which if you read all seven books, pretty much smacks you over the head. 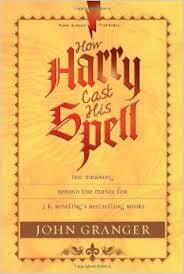 When John Granger's children first wanted to read Harry Potter, he told them he had to read them first. He had heard of the controversy and wanted to be careful what his children read. After reading the book, he not only allowed his children to read these books, he required them to do so. Granger went on to study the books and to become a veritable expert in all the symbolism in Harry Potter. When I read the Harry Potter books to my own children, I was amazed by the brilliance of J.K. Rowling's mind - the way the whole series was interwoven, every character important, every word mattering. After reading this book by John Granger, that amazement has only grown. I consider myself fairly well-educated and thought I had picked up on a good amount of the symbolism in these books. I didn't even come close. J.K. Rowling studied a variety of classical and modern languages, is steeped in knowledge of English classics such as C.S. Lewis and Jane Austen, and immersed herself in the study of esoteric and literary alchemy prior to writing these books. She is also has a Christian background, having been confirmed in the Anglican Church. All of this bears fruit in her writings. Granger examines the Christian symbolism in each book and in the series as a whole. This is not as easy read, but it is incredibly well-researched and fascinating. Even if you don't understand everything in these pages, it will give you a great appreciation of what went into writing these books and the Christian foundation they represent. I actually had my teen boys, both Harry Potter fans, read this book as part of their homeschool lessons this year. I heartily recommend it to anyone who is interested in learning more about the symbolism in these books, and to anyone who thinks that the Harry Potter books shouldn't be read by Christians. They begin with a short biography of St. Faustina, the Apostle of Divine Mercy, and the history of the Divine Mercy image. The next chapter focuses on the elements of the Divine Mercy devotion: the image, the feast, the chaplet, the hour of great mercy, and spreading devotion to Divine Mercy. Chapters three through six focus on how we can show mercy to our neighbors (including our families) through the spiritual and corporal works of mercy. The final chapter illustrates how our Blessed Mother is the Mother of Mercy and a role model for all of us. Each chapter begins with a quote from the Diary of St. Faustina and ends by offering practical tips for living a life of mercy. The Appendices include much helpful information. 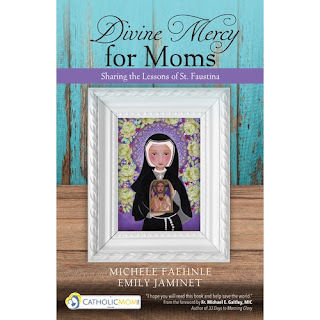 There are prayers, a “Thirty Days of Mercy” which offers mini-reflections on quotes from the Diary of St. Faustina, and a study guide for group use of this book. In this Year of Mercy, Divine Mercy for Moms offers both spiritual nourishment and practical advice for performing works of mercy. It is heartily recommended. All Christians are called to evangelize. This Prayer of Evangelizers was printed in the February-March 2016 issue of The Catholic Mirror. Open my heart to hear and live Your Gospel message. 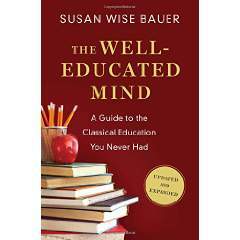 The 2016 version of "The Well-Educated Mind: A Guide to the Classical Education You Never Had" by Susan Wise Bauer is a revised and updated version of a text she originally wrote in 2003. Bauer is well-known in homeschooling circles as co-author with her mother of "The Well-Trained Mind" which offers a plan for providing your children with a classical education while homeschooling, as well as author of the "History of the World" series. She is clearly a brilliant woman who has a great ability to understand, organize, and present a huge volume of information. In "The Well-Educated Mind," Bauer sets out a plan for adults to go back and read and study all those great books that they either missed out on while completing their traditional education or didn't understand if they did tackle them. Make no mistake, this is an ambitious project. To her credit, Bauer realizes that she is writing for busy adults. She suggests dedicating a half-hour a day for four days a week to this endeavor. At that rate, this will truly be a life-long endeavor. The beginning of the book is dedicated to learning how to read and study these books utilizing the classical framework of a grammar, logic, and then rhetoric stage. She then divides the classic works into sections: the novel, autobiography and memoir, history and politics, drama, poetry, and science. Each section is approached in a chronological order so that one may see how ideas and themes developed over time. For each section she provides an introductory essay which offers an overview of the section as well as tips for getting the most out of reading this particular type of text. She also includes a synopsis of each work and why it was chosen. This is not an exhaustive list of great books by any means, but there is an ample selection. Even if one does not undertake the project of actually reading and studying all of these books, simply reading this book will provide quite an education. If one could remember all that is included in its pages, one would be far ahead of most of the populace in terms of understanding the development of ideas throughout history and the authors who have shaped and interpreted our world. You may be familiar with the book, 33 Days to Morning Glory which prepares readers for a consecration to Jesus through Mary. 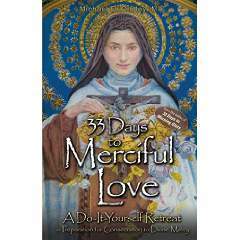 In this follow-up, 33 Days to Merciful Love: A Do-It-Yourself Retreat in Preparation for Consecration to Divine Mercy, Fr. Michael Gaitley of the Marian Fathers invites us to make a consecration to Divine Mercy using St. Therese’s Offering to Merciful Love as our role model. According to Fr. Gaitley, “You don’t have to read 33 Days to Morning Glory before reading this book – but I strongly recommend that you do. I say that because the essence of Marian consecration is to allow Mary to bring us to the pierced side of Jesus, which is the Fountain of Mercy . . . This is the Year of Mercy, however, so if you want to make this consecration to Divine Mercy, I encourage you to do so. Also, the Marians are trying to get as many people as possible to make this consecration on Divine Mercy Sunday this year (April 3rd), which means beginning the process on March 1st. Unlike 33 Days to Morning Glory, this book does not focus on four different saints. Instead, it focuses on St. Therese of the Child Jesus, a Doctor of the Church and one of the most-loved saints of modern times, and her spiritual teaching. As one would expect in a book on Divine Mercy, some of the insights and teachings of St. Maria Faustina Kowalska are also included. Week one of 33 Days to Merciful Love focuses on backstory: the Garden of Eden, Abraham, and Mary, the Mother of God. Week two explores St. Therese’s Little Way. Week three examines the Offering to Merciful Love, and the final week looks at the mystery of darkness in St. Therese’s life and in our own lives. The final five days provide a review of all that has been covered. In order to make this book available to as many people as possible, the Marians are currently offering it for any donation amount (even $1) plus $5.25 shipping. To order, visit www.marian.org/merciful. 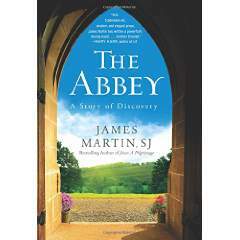 Father James Martin, SJ, best-selling author of My Life with the Saints, Between Heaven and Mirth, and Jesus: A Pilgrimage tries his hand at fiction in The Abbey: A Story of Discovery. Mark is a former architect who now works as a handyman at the Abbey of Saints Peter and Paul. He wonders how his life got off-track and his self-worth hinges on whether a woman accepts his advances. Anne is Mark’s landlord. She is middle-aged, divorced, and struggles every day with the death of her teenage son three years before. Father Paul is the Abbot at Saints Peter and Paul. Mark’s boss, he will be become both his and Anne’s confidant and spiritual director, without them even realizing that is what he is offering. The Abbey is a quality work of Catholic fiction. It deals with the real-life difficulties people sometimes have with faith. As a priest himself, Fr. Martin can offer an honest look at what it means to be a priest and wrestle with one’s vows. He also has both offered and experienced spiritual direction and knows the heartaches and questions that individuals bring to that process. While the characters, especially Anne, develop and grow in their relationship with God during the course of the book, there is no radical change. As is often the case in the spiritual life, small steps are taken slowly. One can only hope the characters will eventually make their way home into full communion with the Catholic Church. There is also some rough language in the book, including taking the Lord’s name in vain, which may be in keeping with the characters’ personalities but could have easily been avoided with no detriment to the story. Overall, however, The Abbey has the potential to do much good. As a work of Catholic fiction published by a big name with a well-known publisher, it has the possibility of reaching and evangelizing those who might not usually pick up a work of Catholic fiction. For those who are firm in their faith, it provides some enjoyable reading that touches the heart and offers insights into the workings of an abbey and those who dwell there. 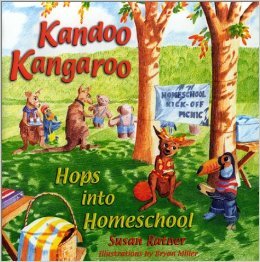 Kandoo Kangaroo Hops into Homeschool by Susan Ratner is a cute picture book designed for a child just beginning homeschooling. Kandoo is full of questions and her mother is happy to help her to find the answers. Her mother tells her, "God wants us to know all about the interesting people, animals and things he created. This world of His is a fascinating place and I've been noticing that the time has come for you to start learning more about it. "When her daughter is scared, she reminds her of Phillipians 4:13, that with God's strength, we can do everything. The pair engage in some fun learning and gather with new friends at a homeschool picnic. At night, she tells her father all about it. This is a great book for a child wondering why all her friends are going to school and she isn't. It introduces the ideas that learning can take place anywhere and that God's world has a great deal to teach us and that homeschoolers have communities of their own. As Catholics, we often think that we know Jesus. After all, most of us have been hearing the stories of his life since we were small children. They are part of who we are, and that is good. But sometimes, we can feel too familiar with the stories and we start to tune them out because we have heard them over and over again. What new thing could we possibly learn? Yet, knowing about a person doesn’t mean that we actually know them. 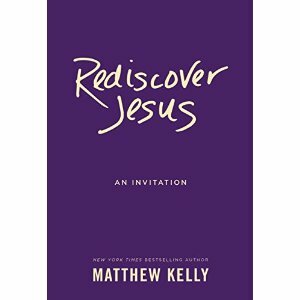 Matthew Kelly of DynamicCatholic.com invites us to actually know Jesus in his latest book, “Rediscover Jesus: An Invitation.” He invites us to have a dynamic relationship with Jesus – one that would change our lives in more ways than we could ever imagine. “The more we discover who Jesus truly is, the more we will place him at the center of our lives. . . . The more we place Jesus at the center of our lives, the more life begins to make sense. Kelly challenges us to consider our answers to two important Jesus questions: Who do you say that Jesus is? and Who does Jesus say that you are? He also examines the Great Commandment: “You shall love the Lord your God with all your heart, with all your soul, and with all your mind. . . .You shall love your neighbor as yourself.” (Matthew 22:39) This commandment seems straightforward and simple, but it “may also be one of the hardest aspects of the Christian faith to live. . . until we learn to love ourselves as God wants us to, our ability to love others will be limited and deformed.” This type of self-love is not full of pride and self-interest. Rather, it is one that is rooted in humility. “Rediscover Jesus” is intended for all Christians. There is no discussion of the Mass or any of the sacraments. The book is weaker for it. Nevertheless, Kelly has a great deal of thought-provoking material in these pages. It serves as either a good introduction to the person and call of Jesus or as an important wake-up call for those of us who have been just going through the motions. No matter where we fall on the spiritual spectrum, we all have room for improvement. In addition, Dynamic Catholic is offering a “Best Lent Ever” program for this upcoming Lent which will feature daily two-minute videos focusing on the topics covered in “Rediscover Jesus.” Find out more at http://dynamiccatholic.com/bestlentever/.